Catalyst Conference – Will you be there? I am off today to attend the Catalyst Conference in Atlanta, Georgia. I am PUMPED to be attending this fantastic conference. 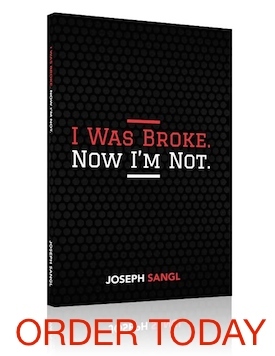 While there, I will give away three FREE copies of I Was Broke. Now I'm Not. and its related Group Study. Are you going to be attending Catalyst and want a chance at the free stuff? If so, send me an e-mail HERE. I will even throw in a free Financial Freedom Experience T-Shirt if your name is drawn and you provide your shirt size in the e-mail. I am so excited to be at the Catalyst Conference. I know that in the past I have been forced to attend conferences that were lousy, boring, and three-ring binder-infested. This is not one of those! There are going to be a ton of fantastic leaders there, and I want to learn from them. Time to rest, think, and reflect on the crusade – this thing is exploding and this is a great time to gear up for "what's next". There is nothing like being challenged by PROVEN leaders who have "Been there. Done that." NewSpring Church paid for it. It is awesome when your employer invests in your personal development. What other conference or forum should I have on my radar? See you there my friend! Looking forward to it.